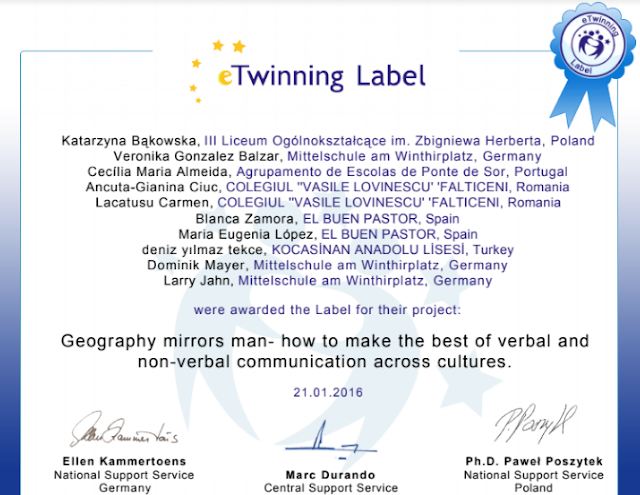 Geography mirrors man- how to make the best of verbal and non-verbal communication accross cultures. Aim: To encourage dialogue between cultures through similarities and differences in behaviour, eliminate misunderstandings, raise awareness of non-verbal communication – make it an advantage in job searching across Europe. 1) Introducing. Getting to now each other. The students get to know Twin Space, create their accounts and profiles, write information about themselves ( intrests, home town etc.). Task 1. Aim: comparing the use of polite words in different countries. A questionnaire. For each emotion the students describe how in their countries the people express the emotions using visible elements e.g. body language, gestures, voice, clothes, eyes etc). The students comapre the results, spot the differences and similarities accross cultures, write their comments.Are there any differences in gestures showing emotions accross Europe? Is non- verbal communication important? What does our body tell about us? When can it be of big importance? Why? 2) Un unsuccessful job interview:' I don't believe in what I'm saying' ( wrong body language, voice, clothes etc). The students sum up their work, find the improper behaviour, comment on the improvements. The students work out the set of norms of proper behaviour. The Code of Proper Behaviour- useful tips on how to make your verbal and non-verbal communication successful. The students may use e.g. spicynodes tool for visual presentations( mind mapping and planning) to present the Code of Proper Behaviour. 1. 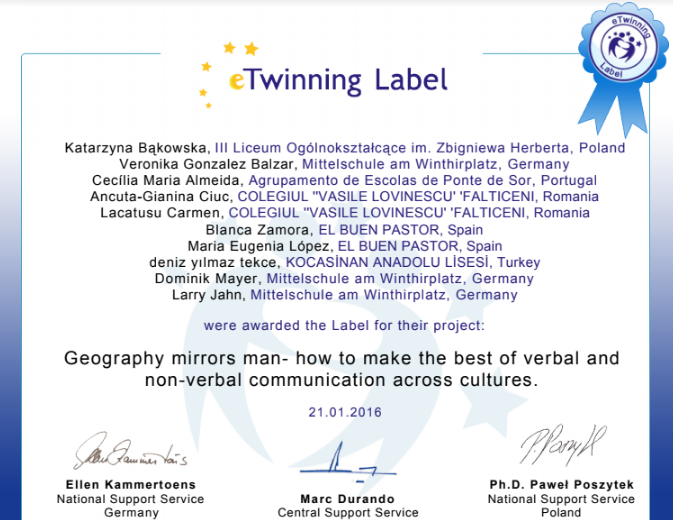 Students from Romania, Turkey, Germany, Spain, Portugal and Poland examined how people express different emotions in their countries, they took the picures of the people around then and formed a gallery of the emotions in different countries ( available on twinspace). 2. The students discussed with teachers about the positive and negative aspects of body language, the messages our body sends through certain gestures, facial expressions. 3.The students conducted the questionnaire about the usage of polite words in their countries.